Systemic fibrinogen and neopterin are related to inflammation. We investigated the prognostic utility and possible interactions of these biomarkers in stable coronary artery disease (SCAD) patients undergoing coronary angiography. We included 3,545 patients with suspected stable angina with a median follow-up of 7.3 and 10.2 years for incident acute myocardial infarction (AMI) and all-cause mortality, respectively. Prospective associations were explored by Cox regression. Potential effect modifications were investigated according to strata of fibrinogen, neopterin or high-sensitivity troponin T (hsTnT) below and above the median, as well as gender and smoking habits. During follow-up, 543 patients experienced an AMI and 769 patients died. In a multivariable model, the hazard ratios (HRs; 95% confidence interval [CI]) per 1 SD increase for fibrinogen in relation to these endpoints were 1.30 (1.20, 1.42; p < 0.001) and 1.22 (1.13, 1.31; p < 0.001), respectively. For neopterin, the HRs (95% CI) were 1.31 (1.23, 1.40; p < 0.001) and 1.24 (1.15, 1.34; p < 0.001), respectively. No significant interaction between fibrinogen and neopterin was observed. The prognostic utility of neopterin for incident AMI was improved in patients with an hsTnT above the median, for total mortality in non-smokers, and for both total mortality and AMI in females. 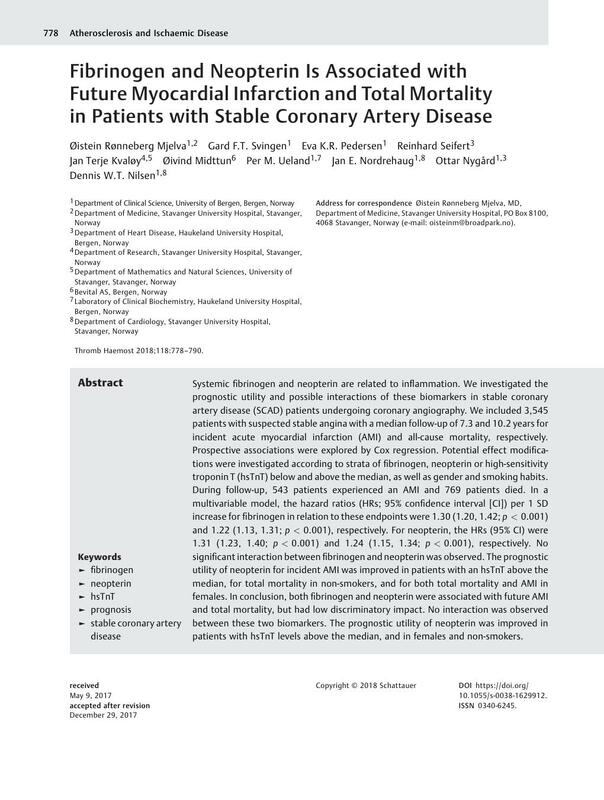 In conclusion, both fibrinogen and neopterin were associated with future AMI and total mortality, but had low discriminatory impact. No interaction was observed between these two biomarkers. The prognostic utility of neopterin was improved in patients with hsTnT levels above the median, and in females and non-smokers.